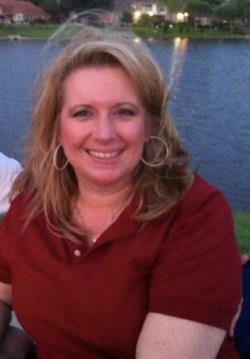 UPDATE: Janice was found at DFW International Airport Sunday afternoon, according to NBCDFW. She was found in an airport bathroom, dehydrated. Janice Klein, 47, has not been seen since she told her daughter she was going to sit in the backyard of her home on the 4500 block of Salerno Circle in Plano, Texas on Friday. More than 400 volunteers searched for her on Saturday and distributed fliers. THey focused the search near Park Blvd. and Preston Rd. where a manager at the Williams-Sonoma store told police that a woman that matched Janice’s description was seen there on Friday afternoon. Janice who is a former teacher at Prestonwood Christian Academy, had been suffering from stomach pains and headaches and her family think she might have become disoriented and walked away, leaving her purse, cell phone and vehicle behind. Janice is 5’5″ tall, 145 pounds with blonde hair and blue eyes. She was wearing a green shirt with gray pants. If you see her, please contact the Plano police at 972-424-5678.